I have a small conversion spray gun (gravity feed) that I purchased from TCP Global Corporation a few months ago. I’ve used it some with mixed success. My biggest problem is not knowing how to adjust the air flow knob at the bottom of the gun handle. I can’t find a lot of instruction anywhere. A video I watched said “just leave it alone”. Most instructions I find don’t mention it at all. One instruction I have says to close the knob all the way and then listen to the air flow as I open it up until it sounds good. Another is a little more helpful by showing a spray pattern that looks like a figure 8 if air flow is too high and an oval shape if the adjustment is OK. I know that this pattern (oval to round) is otherwise adjusted with the knob on the side of the gun. Can someone explain this better? 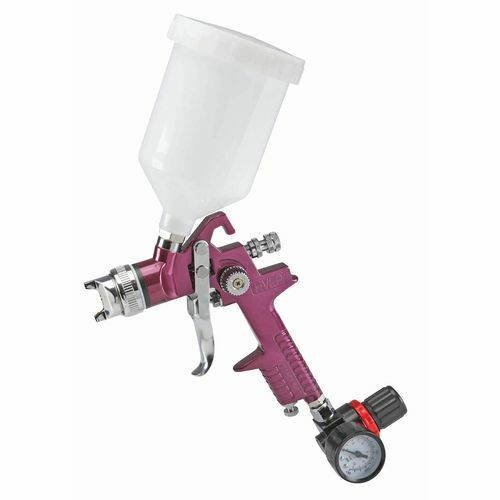 Does your spray gun have pressure regulator at the bottom of the handle like in this picture? If it does open the other knob all the way and leave it there. Use the pressure regulator to adjust income air. If it goesn’t get one, it will make life easier. As AlaskaGuy said, using a regulator right at the gun is best while keeping the airflow knob at the gun open as much as possible. In addition, keep your air hoses/compressor at somewhere like 90 psi (as long as the regulator at the gun can handle it). This is so your gun can get as much air as it wants. Then you want to adjust the regulator at the gun to the least amount of air necessary to maintain good atomization. You may want to use a viscosity cup and thinner the first time to get the paint to the recommended viscosity for your gun and tip first. Then I usually start out at 30-40 psi and do a test spray on a cardboard box, then tweak the air up if its splattering or tweak it down if its bouncing back/overspray. +1. Just a cheap regulator with gage. The gage doesnt have to read absolutely correct just the same reading each time for the same pressure then you will get a feel for what pressure reading you need depending on the viscosity sprayed. Yes. It does have a regulator/gage at the inlet. Regarding the airflow knob; what is considered to be “all the way” open. I can keep screwing it counterclockwise until it all comes apart. Is the airflow knob never used to reduce or increase airflow during setup? If not, why is it adjustable? While I agree with having a regulator on the gun, I disagree that controlling the air flow with pressure is the right way to do it. If that was the best way, guns wouldn’t have a flow control, only a regulator. Your house wouldn’t have flow control on the faucets, there would be a pressure regulator to adjust instead. Regarding its setting, I find it is determined by the viscosity of the material you’re spraying. You need air volume to atomize the spray, but not so much that the spray bounces al over the place. I spray mostly dyes and lacquer, which have a similar enough viscosity that I can just leave the flow setting at one position, but if you’re doing paints, etc, you might need to tweak it along with the fluid flow. Practice on the side of a cardboard box so you can see your pattern, and tweak the flow until you get a smooth finish without a massive cloud forming. Once you get a feel for how air flow and fluid flow affect the spray, it’ll be easy. Rich and I will have to agree to disagree. The aircap of a given gun is the orifice through which flow is to be controlled, and it is a fixed size. Controlling pressure drop across an orifice controls the mass flow. By using the regulator (at the gun, not compressor) full control of air flow is provided and repeatable, as long as the pressure to the regulator exceeds tthe regulator setting with the trigger pulled plus about 10 psi. This allows any hose length any dia to be used. While the airflow through the cap can also be controlled by using another variable size orifice ( the gun flow control), there is no gain to the process, but rather increased confusion. Now what was the pressure set at and what was the flow control set at? Keeping track of 1 vs 2 variables cuts the confusion by 50%. IMO the gun air flow control is there for cases where a gun mounted regulator is not available or used. Im not saying the gun flow control cant be used, but that it is simpler to set it wide open all the time and forget it. You’re right. We do disagree. You also disagree with Jeff Jewitt. In his Spray Finishing Made Simple book and DVD he says to set the pressure on the gun-mounted regulator to the recommended value for the gun, and gives techniques to achieve 10 psi at the air cap if you don’t have that recommendation from the manufacturer. I have never seen any instructions that suggest controlling the air flow via psi. For reference, compare it to a turbine unit. The turbine puts out a constant cfm and psi. At the gun, you control the air flow and fluid flow. Those are the two variables, and psi is not one of them. While these two guys argue, can someone try to answer my questions? BTW, I’ve been told that this gun (TCP F3-SET) is not actually an HVLP gun. Not sure if it matters. BTW, I ve been told that this gun (TCP F3-SET) is not actually an HVLP gun. Not sure if it matters. I was just in the process of putting together a thorough start-to-finish explanation for setting up and using a conversion gun based on my years of experience and Jeff Jewitt’s book (which this thread has prompted me to re-read), but with your snotty “while these two guys argue” comment, I think I’ll pass. Best of luck to you. If you go with the pressure adjustment suggestions, you’ll need it. It sounded more practical that “snotty” to me but what do I know. I have the same video and book from Jeff. I’ll have to review it myself. Maybe this is one of the things that there is more than one way to skin a cat. I do it like I said in my first post and I don’t have anything but good luck (IMO). If you are going to take your ball and go home I will report what I find sometime to tomorrow after I review the book and video. but with your snotty “while these two guys argue” comment, I think I ll pass. Sorry to have touched a sensitive spot. The comment was meant somewhat in jest (I should have included a smiley). But, It was also an expression of some frustration that you were both going well beyond (IMO) my basic questions. It’s bad enough that no good instructions came with the gun or seem to be available anywhere on the net. Thanks for trying. I just finished watching Jeff’s video. The section on “using a compressor system”. The gun used was a gravity feed gun very similar to the one in the picture I posted. In his setup procedure he pointed to the air inlet nob and said “maker sure you open this all the way”. No other mentions or explanation was made. I vaguely remember when I was starting out I read or was told that I had the option to a buy pressure gauge and use it instead of the air inlet adjusting knob because it would be easier to use with the visual reference. On a side note some of the higher end gun don’t appear to even have an inlet adjusting knob. So I assume your only choice it to use a presser regulator set up. OK. But what does “all the way” mean? I can guess by sound and feel, but is there a better way? Many of the instructions on the net seem to parrot that same statement with nothing said about why or how. This video show what each knob on a spray gun does. A the 2:40 mark he explain the air inlet adjusting knob.